With a large amount of patient data at risk and shifting dynamics of cyber attacks, the healthcare industry needs to focus on leveraging technologies to strengthen their cybersecurity. Healthcare industry has a pool of technologies and processes ranging from cognitive technologies like big data analytics, artificial intelligence to blockchain for ensuring cutting-edge cybersecurity. Big data analytics enables healthcare organizations to recognize and mitigate cyber attacks in real-time by executing various complex analysis at a faster rate. On the other hand, AI approaches healthcare cybersecurity through enhanced visibility of the threat combined with improved collaborations among the cybersecurity systems to enhance the healthcare systems ability to recognize the cyber attacks. Additionally, when combined with automation, AI offers a comprehensive and intelligent cybersecurity system which can make its own effective and autonomous decisions to prevent potential threats. Healthcare industry can also employ blockchain applications to improve the security and privacy of patients and clinical drug trial data as it organizes data to verify record transactions through the consent of all involved individuals. Cybersecurity is an essential part of the healthcare industry, and with confidential data of patients at risk, cybersecurity solutions need to be advanced and reliable. 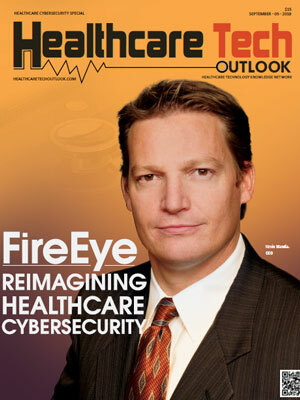 Knowing this, a distinguished panel comprising of eminent CEOs, CIOs, VCs, and analysts along with the editorial board of Healthcare Tech Outlook have hand-picked ten most reliable and promising healthcare cybersecurity solution providers.